China returned to flight with the launch of a military communications satellite from the Xichang Satellite Launch Center, exactly one month after the launch failure that destroyed the SJ-11 ShiJian 11-04 military satellite. The launch of this new communications satellite, the ZX-1A ZhongXing-1A (ChinaSat-1A) toke place at 16:33 UTC on Sunday using a Long March 3B/E (Chang Zheng-3B/E) launch vehicle. 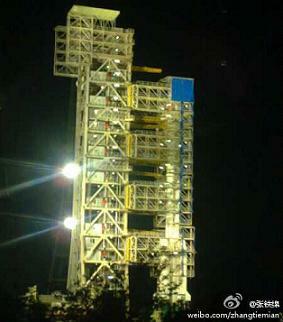 The ZhongXing-1A satellite is based on the DFH-4 platform and has a launch mass around 5,200 kg. It was manufactured by the China Great Wall Industry Corporation (CGWIC). This may be a new generation of the FengHuo tactical military communications satellite, used to provide secured digital data and voice communication to Chinese military forces. The first FengHuo satellite, ZX-22 ZhongXing-22 (26058 2000-003A), was launched at 1645:06UTC on January 25, 2000 by a CZ-3A Chang Zeng-3A (Y4) launch vehicle. A replacement was launched at 1602:00UTC on September 12th, 2006. The ZX-22A ZhongXing-22A (29398 2006-038A) satellite was launched by a CZ-3A Chang Zheng-3A (Y10). The DFH-4 (DongFangHong-4) platform is the third generation communications satellite bus, sporting high power, strong payload capacity and extended service life. It consists of propulsion module, service modules and six meter solar arrays. The applications for the DFH-4 platform aren’t limited to high capacity broadcast communication satellites and can be used to tracking and data relay satellites, regional mobile communication satellites. The satellite has a payload capacity of 588 kg and an output power of 10.5 kW though to the end of its lifetime. Its design lifetime is 15 years and its reliability to live for that duration is more than 0.78. The platform is being sold as one which will meet the needs of international and domestic large communication satellite markets. The satellite is equipped with three receiver antennas and two transmission antennas. The DFH-4 satellite also features strong capabilities against hostile disturbance and jamming. The dimensions of the DFH-4 bus are 2.360 m × 2.100 m × 3.600 m.
After leaving the launch pad on a column of smoke propelled by the four liquid strap-on boosters and the YF-25 first stage engine, the CZ-3B/E climbed through the night sky lightning up the space launch center. The separation of four strap-on boosters came at T+141 seconds (or 1635:25UTC). First stage separation took place at 159.5 seconds (1635:45UTC) followed by fairing separation at T+235.6 seconds (1637:00UTC). After the burn-out of the YF-21C second stage engine, second stage separation occurred at T+344.2 seconds (1639:09UTC) and the same time that the YF-24E third stage engine pack ignited for the first of two burns o the mission. This burn ended at T+619.8 seconds (1643:24UTC). The third stage entered on a parking orbit before igniting for the second time at T+1264.5 seconds (1654:09UTC) with a burn duration of 2 minutes and 56 seconds, ending at 1657:05UTC. The third stage YF-23C vernier engines shutdown 19 seconds later. Spacecraft separation took place at T+1540.9 seconds (1658:45UTC). To meet demand of international satellite launch market – especially for high power and heavy communications satellites – the development of CZ-3B Chang Zheng-3B launch vehicle started in 1986 on the basis of the fight proven technology of Long March launch vehicles. 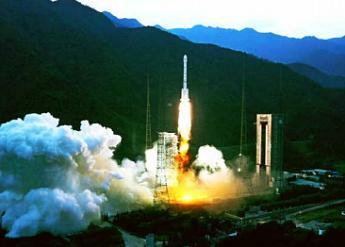 The Chang Zheng-3B (CZ-3B) is the most powerful launch vehicle on the Chinese space launch fleet. The CZ-3B features enlarged launch propellant tanks, improved computer systems, a larger 4.2 meter diameter payload fairing and the addition of four strap-on boosters in the core stage that give an additional help during the first phase of the launch. The rocket is capable of launching a 11,200 kg satellite to a low Earth orbit or a 5,100 kg cargo to a geosynchronous transfer orbit. The rocket has a total length of 54.84 meters and a core diameter of 3.35 meters. In recent years, the CZ-3B/E (Enhanced Version) launch vehicle was developed on the basis of CZ-3B, increasing the GTO capacity up to 5,500kg. The CZ-3B/E has nearly the same configurations with CZ-3B except its enlarged core stage and boosters. With the GTO launch capability of 5,500kg, CZ-3B/E is dedicated for launching heavy GEO communications satellite. This was the 146th successful Chinese orbital launch, the sixth launch from Xichang in 2011 (the 65th overall from Xichang), and the ninth successful orbital launch for China in 2011. The Xichang Satellite Launch Centre is situated in the Sichuan Province, south-western China and is the country’s launch site for geosynchronous orbital launches, focusing on broadcast, communications and meteorological satellites. 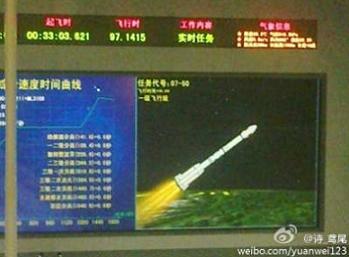 The center’s headquarter is in Xichang City, a distance of 65 km from the launch site. The climate in the region is subtropical, with an average annual temperature of 16 degrees C. Ground wind in the region is generally very mild all the year round. The ShiJian 11-04 launch failure delayed the Chinese space launch schedule for the current year, notably the launch of the TG-1 TianGing-1 space module. The investigation showed that a flaw in the connecting mechanism between vernier engine no. 3 and the attitude control mechanism of the second stage of the CZ-2C Chang Zheng-2C launch vehicle had led to loss of attitude control on the second stage. Chinese specialists initiallly noted that the failure wouldn’t delay the launch of the TG-1, but days after the accident it was obvious that this launch was going to be pushed to the right. Apparently, the launch of TianGong-1 was originally schedule for August 30, with rumours pointing to a September 27 launch date. Also, Eutelsat announced that the launch of its W3C communications satellite from Xichang was to be delayed to October.